Jawbone, the company best known for its Bluetooth headsets, has released a wristband and accompanying app that tracks your sleep, diet and exercise habits, and even nudges you to do something about it. The system is called UP, and it will hit retail outlets Nov. 6 for $99. UP, which originally debuted at a TED Global event, centers around something Jawbone calls its "MotionX" engine inside the wristband. The band resembles a bulkier version of those yellow Livestrong bracelets, and keeps track of all your activity and sleeping patterns thanks to the motion-tracking engine and other sensors. The companion app then asks for photos of your meals and answers to a few questions about how certain foods make you feel. The idea is to collect as much data as unintrusively as possible to then create, as the company puts it, "a complete, holistic view of your health" that can be accessed from the app at any time. Jawbone's hope is that UP will not just track personal health, but also nudge users into action. It uses two strategies: First is an integrated sharing of your progress with a "team" of friends chosen to cheer you on in reaching your health goals, and second -- the wristband will physically nudge users to action. A silent vibration alarm in the band can wake a user at the best moment in their sleep cycle, and send messages throughout the day to break up long periods of inactivity with movement. 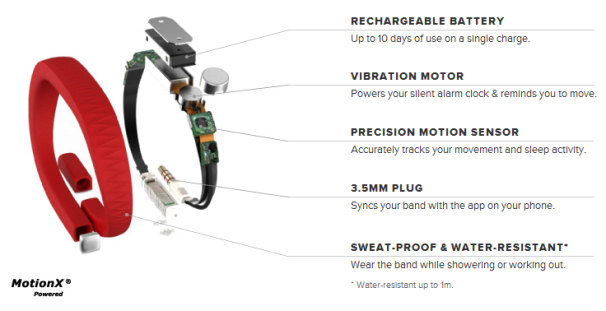 Jawbone says the band is sweat-proof and water resistant, and its battery can last 10 days on a single charge. A hidden 3.5mm plug syncs the wristband with the iOS app, which is available for free in the App Store. The band comes in different colors and sizes.